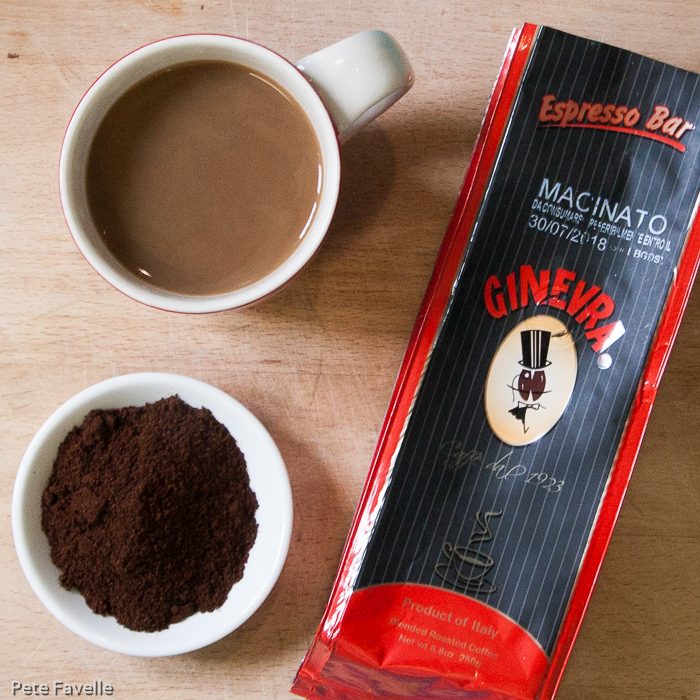 Another coffee from Italian roaster Ginevra this week, and definitely a more Italian style one. On a side note; to expose the depths of my lingual ignorance, I nearly thought this coffee was called ‘Macinato’. It was only thanks to the power of Google Translate that I realised at the last moment that this is, in fact, the Italian for ‘ground coffee’. The Espresso Bar grounds are seriously dark in appearance. The aroma, too, is of deeply roasted beans – black cherries and lemons, touches of burnt sugar along with a suggestion of dark, worn wood. Brewed, the lemon juice comes through more strongly along with hints of dark, bitter chocolate. In the mouth it’s rich and full bodied; dark fruits with just a little sugar, all quickly washed away with a powerful, tannic bitterness that becomes almost too powerful in the finish. There are hints of old wood peeking out behind the bitterness, and quite a gentle acidity. It’s a little frustrating; there’s a seriously tasty coffee here but it’s masked by the bitterness. Despite making it in my usual ‘caffe americano’ manner, the coffee is showing it’s espresso roots a little too strongly for my tastes. So, a great coffee if you like a strong Italian cuppa but a little too robust for my tastes – 3 stars. Many thanks to Caffe Ginevra for providing samples of this coffee.